I love fall! It has always been my favorite time of year. The crisp fall air and the beautiful leaves. Yes, I admit even at my age, I still love to crunch through piles of leaves. In Colorado, the mountain aspen trees turn the most amazing colors of orange, and gold and yellow. The beauty doesn’t last long, and I am sad to admit that many years pass when I fail to make it the few short miles from my home on the front range, up into the mountains to see the glory. This year, however, my daughter is getting ready to move out of state so on Monday, we decided to spend the day together in the mountains. We drove west out of Fort Collins and up to the top of the Poudre Canyon just at the right time. The day and the scenery was perfect. 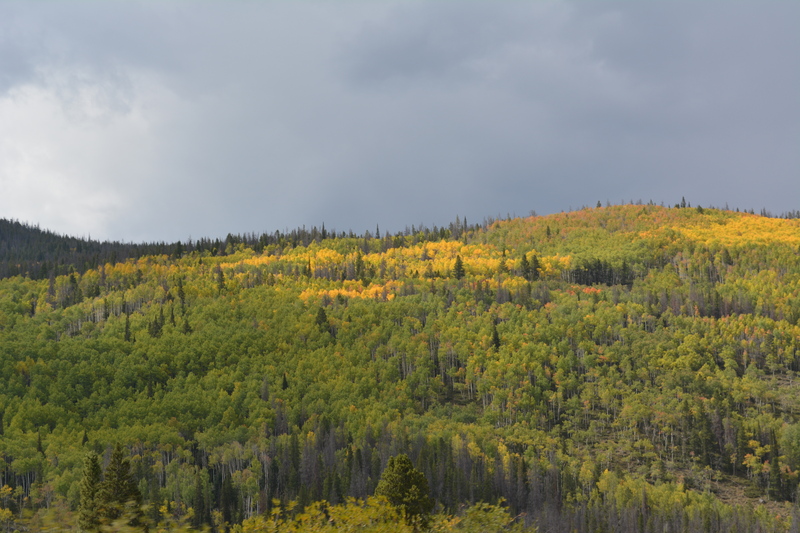 The Aspens were in peak form, bright spots of varying shades of yellow, gold and orange covered the hillsides. Near the top of Cameron Pass, we got out and hiked around, taking pictures of the amazing scenery. The day was sunny and warm, the last remnants of summer air. I love living in Colorado and was once again reminded not to let day-to- day life get in the way of taking time to enjoy the splendor of our spectacular state.